Happy “Earth, Wind & Fire Day”! Wait, you’ve not heard about Earth, Wind & Fire Day? That’s OK, it’s not a major holiday. It’s just a fun thing that some weird people (like me) celebrate on September 21st. In that sense, it’s kind of like Elvis Week or Star Wars Day. Earth, Wind & Fire is a musical group that was most popular in the 1970s and 1980s. They sang some really great, funky songs that you may have even heard before, but you might not have realized who sang them. 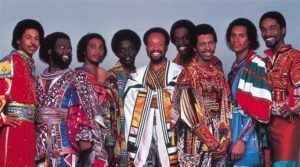 Possibly their most famous song—or at least my favorite EWF song—is “September.” They have some other great ones like “Let’s Groove,” “Shining Star,” and “Boogie Wonderland,” all of which you may have heard. And if you’ve not heard them, you definitely need to check them out. Your day will be a lot happier if you do! I mentioned “September” on this blog a few years ago at the start of September, but in the meantime I made an activity that I’ve used in some of my English classes. So I thought I’d share that activity with you. If you’re a student, you can just listen to the song, complete the lyrics, and enjoy how amazing the song is. If you’re a teacher, you can download the activity to use in your classes. There are also a few light, easy discussion questions. It’s just a simple, fun song that’s mostly about love and remembering great events in the past. At least I think that’s what it’s about. What do you think? If you use this activity, or if you’re a teacher and you use it in a class, please let me know. I’d love to hear from you! Thanks for reading, and have a great Earth, Wind & Fire Day!